Shop Mitchum Power Gel Anti-Perspirant & Deodorant Mountain Air (2.25 oz. )2.25 oz. 2 for 8 dollars and 00 cents or 1 for 4 dollars and 49 cents 2/$8.00 or 1/$4.49$2.00 / oz. Shop Mitchum Power Gel Anti-Perspirant & Deodorant Unscented (2.25 oz. )2.25 oz. 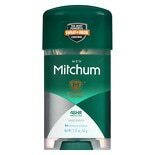 Mitchum Power Gel antiperspirants are available in convenient stick form. The powerful antiperspirant gel in Mitchum Power Gel sticks goes on comfortably and keeps you dry all day. Mitchum Power Gel sticks contain clear gel that is easy to apply. The gel dries quickly and does not leave behind any white residue that can stain clothing. Unlike many other deodorants and antiperspirants, Mitchum Power Gel products do not contain alcohol, which can dry the skin. Mitchum Power Gel sticks are available in scented and unscented versions. The scented versions of Mitchum Power Gel antiperspirants include Sport, Fresh Wave and Mountain Air. Special Mitchum Power Gel antiperspirants for women are also available in three fresh feminine scents as well as in an unscented version. 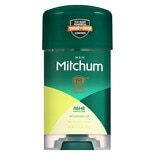 Mitchum Power Gel antiperspirants are made with Odorguard technology, which kills bacteria that cause underarm odor as soon as you apply Mitchum Power Gel to your underarms. This technology means that Mitchum Power Gel is an effective deodorant as well as an antiperspirant. It also contains the highest amount of active ingredients to fight wetness, so it keeps you protected throughout the day. Whether you choose scented or unscented Mitchum Power Gel antiperspirant sticks, you will not have to worry about odor and wetness no matter how active you are during the day. Be certain to order enough of your favorite Mitchum Power Gel antiperspirant for shipment right to you.